Losses to the agricultural, industrial and energy sectors from Sunday night’s killer rainstorm are expected to total millions of rupees, officials said. Heavy rain and strong winds lashed two districts in the central Tarai region killing at least 31 people. More than 600 people sustained injuries. The Nepal Electricity Authority said its estimated losses could be around Rs150 million due to the damage to the electricity distribution system in Bara and Parsa districts. The Ministry of Agriculture said it had not ascertained the losses, but said they could run into millions of rupees. Most of the destroyed homes were built of clay and zinc sheets which collapsed when electricity poles and trees fell on them. According to the power utility, around 2,000 electricity poles were knocked down by the powerful rainstorm. It said that 1,000 to 1,500 electricity poles fell in the area under Kalaiya sub-station alone. In addition, power lines have been broken in many locations in the affected areas. As a result, electricity supply has been disrupted in many places. The storm also damaged the 132 kV Parwanipur-Raxaul cross-border transmission line. Nepal has been importing 50 MW of electricity from India through the transmission line. 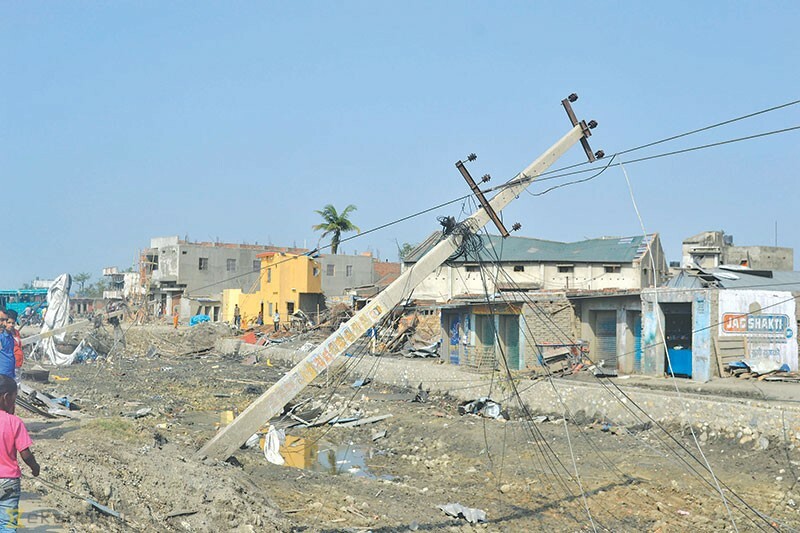 The rainstorm also wrecked another 33 kV Birgunj-Raxaul cross-border transmission line that is being used to import 12 MW from the southern neighbour. The storm damaged the 66 kV Parwanipur-Birgunj double-circuit line and the 33 kV Birgunj-Kalaiya line leading to a disruption in electricity supply in Birgunj city. The Nepal Electricity Authority said electricity supply from Kalaiya sub-station was restored after maintenance. “Repair work has been started in other affected areas as well to restore power to these places,” the utility said in a press statement. It claimed that power supply in other locations apart from these two districts were unaffected. Tej Bahadur Subedi, spokesperson for the Ministry of Agriculture and Livestock Development, said the ministry was yet to determine the amount of losses in the agriculture sector. “We have asked for details of the losses in the respective districts,” he said, adding that they could reach millions of rupees. “The local governments will find out the actual losses and produce a report.” The government has no immediate plans to compensate the farmers for their losses. Sunday’s rainstorm has inflicted a heavy loss to factories operating in the Parsa-Bara Industrial Corridor. Narayani Cement Udyog, Narayani Modern Pulses Industries, and Narayani Refinery and Oil Mill said they incurred losses in excess of Rs500 million. The factories belong to Chachan Group. Umesh Chandra Thakur, manager at Narayani Cement, said the storm had knocked down compound wall, roof of his factory, and power lines. “This has left the manufacturing process to a complete halt,” Thakur said. Kalash Cement and Bishwokarma Cement have also reported damages due to the disaster. Anil Agrawal, manager of Kalash Cement, said the factory’s roof was blown away in the incident. The factory has estimated its loss at Rs10 million.